Fed Funds Rate Where To? Over the last 12 months, the Fed made two important policy reversals. Last December, it raised the Fed funds rate for the first time in nearly a decade. Our past commentaries outlined the reasons why we expected the Fed to be more aggressive with the frequency of its rate increases than investors expect. We dubbed that regularity the Fed’s “ex-lax” policy. If our expectation proves correct, then the Fed funds rate will likely wind up at 2.00-2.25% by the end of 2018. For perspective, Goldman Sachs pointed out that the last time unemployment matched our current lows, the Fed funds rate stood at 5.25% and on its way up. The Federal open market committee (FOMC) guides monetary policy. Its changing composition next year could lead to modification of our outlook for monetary policy. The FOMC includes the Fed’s seven governors plus five voting presidents from the twelve regional reserve banks. When Congress confirms the new Fed chair, Jerome Powell, chair Yellen announced she would then leave the Fed. With her departure, there will exist four vacancies among the Federal Reserve’s board of governors. Among the five voting presidents, New York Fed president Bill Dudley announced he would resign at mid-year. The outlook for monetary policy awaits the naming and confirmation of the new Fed governors. In the past, the slope of the yield curve could prove to be a valuable predictive tool of economic activity. In particular, when short-rates moved above long-rates, it generally signaled slowing economic activity. Normally, the Fed then followed with rate cuts. Before the financial crisis, the Fed did not attempt to manage the long-end of the yield curve since it lacked the tools to do so. Today, the Fed attempts to manage both ends of the yield curve. It does this by combining the traditional management of the Fed funds rate at the short-end with the unconventional tools of quantitative easing and tightening at the long-end. As a result, managing the yield curve by the Fed and other central banks may lessen the predictive powers of changes in the yield curve slope. This manipulation may, therefore, lessen the interpretive value from the current flattening of the yield curve in the United States. Quantitative tightening will result in the Fed gradually shrinking its $4.5 trillion balance sheet. As a result, by the end of 2018, the Fed will let $30 billion of Treasuries and $20 billion of mortgage-backed securities mature each month without replacing them. Economists project the Fed will ultimately reduce its balance sheet to $2.5-$3 trillion. Before the financial crisis, the Fed’s balance sheet totaled less than $900 billion and held no Treasuries or mortgage-backed securities. As a result, the Fed primarily focused on moving the Fed funds rate either up or down to effect its policy shift. Therefore, much history exists for investors to judge the impact of such rate changes but none to judge the impact of QT. Even with the advantage of history, judging the effect of just a change in the federal funds rate proves difficult enough for investors. Now add to that analytical difficulty by simultaneously reversing two monetary policy variables—not just one. As with the shift to QT, history provides investors with a little basis for making judgements when combining the reversal of two policies. In 2018, the Fed’s quantitative tightening will gradually reduce its purchase of Treasuries and mortgage-backed securities. The result will be greater dependence on private sector buyers for absorbing their issuance. 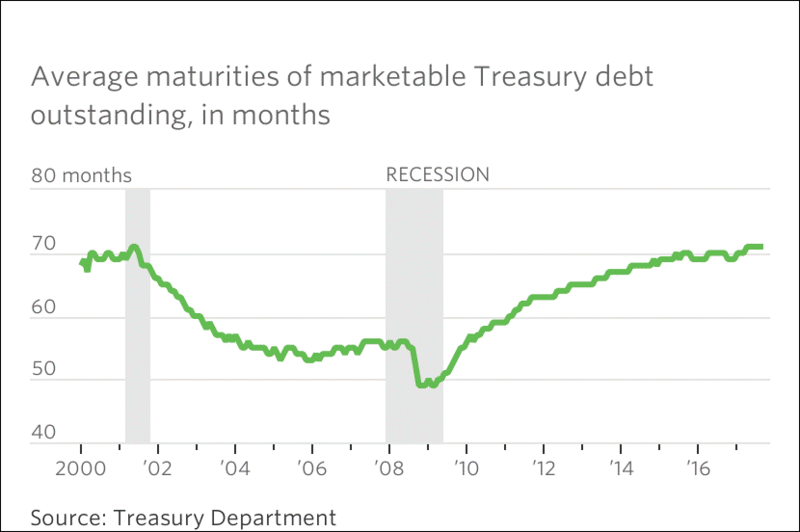 At the same time, the relative increase in the Federal deficit will add further to the supply of Treasury debt. More specifically, the federal deficit ran 3.5% of GDP at the end of October compared to 2.6% at the same time last year. Additionally, the enactment of tax reform legislation would add an estimated $1.5 trillion over ten years to this higher relative deficit burden. Therefore, the Treasury Department recently altered its strategy for issuing debt. They did so to reduce the upward pressure on long rates resulting from the Fed’s reduced purchases of Treasuries. To do so, Treasury will increase its shorter-term debt issuance. As the graph below shows, the new Treasury plan would reverse a nearly decade-long strategy of issuing longer duration debt. With Treasury taking some pressure off long rates, this should also benefit the mortgage financing market. Rates in that market trade based on Treasuries and also face reduced Fed purchases from QT. We typically end our comments on the reversal of Fed monetary policies by repeating the old market adage, “do not fight the Fed.” This past decade sure proved that advice to be correct.